National Award-winning director Jayaraj is amused at the sudden interest in a film he made about 10 years ago. It was in 1997 that Jayaraj made a brilliant film called Kaliyattam; his interpretation of William Shakepeare's Othello. Kaliyattam won two major awards that year at the national level; Jayaraj won Best Director and Suresh Gopi was adjudged Best Actor. 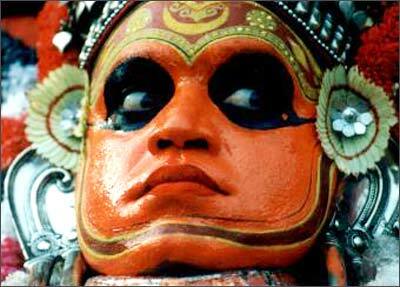 Jayaraj's Othello -- Peramalayan -- was a theyyam artiste. In theyyam, one of the oldest visual art forms of North Kerala, the artiste or dancer dresses up colourfully. The term theyyam is a corrupt form of daivam, meaning god. It is a rare combination of dance and music, and reflects features of tribal culture. Kaliyattam is the story of a Theyyam artiste Perumalayan (Suresh Gopi), his beautiful wife Thamara (Manju Warrier), his friend Paniyan (producer Lal acting in a film for the first time) who sows the seeds of jealousy in Perumalayan's mind, and Kanthan (Biju Menon), with whom Thamara was said to be having an affair. In an exclusive interview with Shobha Warrier, Jayaraj recounts the most acclaimed film of his career.